Colonia Ambra is a perfume by Acqua di Parma for men and was released in 2015. The scent is woody-spicy. It is being marketed by LVMH. As a newcomer here, I'm going to try my hand at a series of comments. This is the fourth part. François Demachy (*1949) is a "primal rock" of the fragrance industry. And not only because he grew up in Grasse and thus grew up with the scent of lavender and jasmine, but also because he was already active in so many well-known (scented) houses and created various classics. So with Mane (like also Christine Nagel, see 24 Old Bond Street), Chanel (from 1978 and created there with Antaeus (1981) my "all-time-favorite" classic), Givenchy, Fendi, Ungaro, Tiffany and of course Dior. There he created almost all the Dior fragrances of my youth, like Égoiste (1990), Eau Sauvage and Fahrenheit. It is interesting in this context that in 2013 François Demachy had Christian Diors (the Château de La Colle Noire, half an hour's drive from Grasse), the old, heavily dilapidated country estate bought again in order to set up a new creation laboratory there and grow flowers himself. He wanted to be the master himself about which ingredients are used in the brand's fragrances and which raw materials are used. Since 2006, François Demachy has been head of development for the cosmetics and perfume division of the giant LVMH (Louis Vuitton Moët Hennessy), which means "luxury" for everything, and he has been Dior's "head nose". Since (like Dior) Acqua di Parma also belongs to the LVMH Group, it is obvious that he also plays a decisive role in the design of fragrances. The first fragrance of the later company "Acqua di Parma" was called "Colonia" and was created in a small perfumery in the historic old town of Parma in 1916. After several changes of ownership, the LVMH Group took over the company in 2001. The logo of the brand is still the coat of arms of Marie Louise, Duchess of Parma (1816-1847), who played an important role in the development of the region of Parma. For the sample of Colonia Ambra I would like to thank my favourite perfumery specialist of my trust! 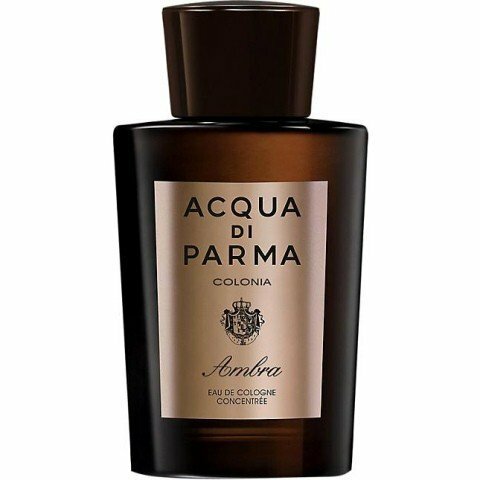 In contrast to Lyric Man, with whom Colonia Ambra (2015) has some similarities in the fragrance pyramid, the start here is dark, resinous, slightly sweet, and in any case slightly wood-tobacco-like. The here therefore rather sweet bergamot is "refreshed" at the beginning somewhat by the orange. I'll take it straight away. For me, the start and the further course of the fragrance remind me very strongly of Bulgari Black (1998). The following floral note (Bulgari Black by jasmine), here by the rose, is somewhat subordinate, but (in combination with the bergamot) brings a beautiful softness, harmony and sensuality to the fragrance. This impression is reinforced (as already with Lumière Noire pour Homme) by Patchouli, which takes the whole thing in an even more earthy, balsamic and velvety direction. Cedar and sandalwood and naturally vanilla harmonize on a slightly sweet base with memories of the Orient. All very warm and pleasant. Incidentally, the scent of sandalwood (as well as patchouli) is said to have an aphrodisiac effect. An ingredient contained in it should smell exactly like a male hormone. In other words, sandalwood is said to be very similar to the scent that men send out as an attractant. I haven't noticed anything yet, well. Instead of the musk at Lyric Man we find at Colonia Ambra the eponym as animal secretion in the base. Ambra (also amber) is actually a grey, wax-like metabolic product from the digestive tract of the sperm whale (nowadays almost exclusively produced synthetically for reasons of species protection). The amber combines and varies the effect between balsamic-warm, woody-tobacco-like up to very slightly bouquet-like. Ambergris (as well as musk) are very often found in the base of fragrances. Colonia Ambra starts very strong, quickly becomes harmonious with a balsamic, woody-tack-like, possibly even a slightly leathery note (this in contrast to the first three rose scents, which are all rather flowery-spicy). The fragrance flattens relatively strongly, which makes it very suitable - at least for me - for daily use in the office. I stick to the fact that he reminds me very strongly of Bulgari Black (for me a "twin fragrance"), and that he is very different from Lyric Man despite very similar fragrances in the composition, not least because of the very restrained rose. I find the average rating of 6.8 somewhat low and increase to 7.5. (4) Colonia Ambra - The "warm (rose) wood"
If a perfume receives ratings in a range of 1.0-9.0, then the basic interest arouses with me. For it is usually an extreme niche scent that polarizes eerily and provokes comments of all kinds. In this respect I was really curious whether a house like Acqua di Parma should have risked something so unusual. Nose open, bottle open, sprayer activated. Hmmmm, first of all the freshness at the beginning known from many AdPs, for me a nice orange opening without any pushiness. Immediately perceptible, even if very subtle at the start, the eponym Ambra, which in the course of time becomes more and more strongly staged, but also skillfully unobtrusive. In the top note the cedar and patchouli are finely interspersed (the rose in the fragrance pyramid hasn't arrived in my lay nose, but I haven't missed it at all), in the drydown the cedar gives way to a finely balanced sandalwood. Some of the previous speakers have complained of a sweet and sometimes intrusive finish, which I believe is due to the addition of vanilla. I'm no friend of sweet notes in perfumes at all, but I think the vanilla is just right here, wonderful for my nose. The Sillage is surprisingly strong in the beginning, leaves after two to three hours clearly after five hours is not really so much left. The shelf life looks a bit better, but here, too, the scent gradually runs out of air and at the end of the day you have to put your wrist to your nose to catch a little "residual heat". Nevertheless, both are above average, although already a bit away from the absolute top notch level. The bottle made nice, old known, look and feel certainly ok and in the dark brown an eye candy in the bathroom, but on a much lower level like e.g. the Secret collection flacons from Moresque, which in a direct comparison represent almost small gems. Although it is marketed as the celebration of the most precious and luxurious ingredient, Colonia Ambra is an ode to Ambroxan, a synthetic ambergris molecule. All I can sense on my skin is strong synthetic musky, salty and fresh odor. Nothing natural or rare, just one-dimensional musky odor with shady woody and oudy nuances. Like a slight, airy evolution of older Colonia Oud. I was really shocked that Acqua di Parma released their own version of Dolce & Gabbana Intenso. I expected some lighter, ambery gentleman's cologne. Colonia Ambra is one of my biggest fragrance disappointing. Simply, not recommended synthetic entity. This smelled so promising in the bottle and when first sprayed. Within five minutes on my skin, though, it turned into a horrifically sharp, burned rubber/petroleum smell, similar to the smell of fresh asphalt, but sharper and more of an assault on the nose. I had to scrub it off with soapy water and then alcohol immediately! I'm so glad I tested before buying! I hope this was a reaction to my skin chemistry, because otherwise I can't imagine anyone wearing it and thinking it smelled pleasant. Write the first Review for Colonia Ambra!